The Intergovernmental Panel on Climate Change (IPCC) special report released in October 2018 focuses on the impacts of global warming of 1.5°C above pre-industrial levels and considers four possible global greenhouse gas emission trajectories or pathways, including several that could potentially limit global emissions to 1.5°C. 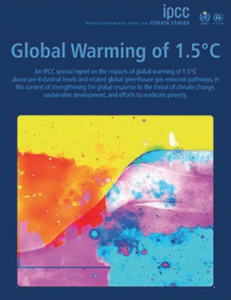 The report (available online at http://www.ipcc.ch/report/sr15/) also seeks to point out how to strengthen the global response to the threat of climate change. The report confirms that anthropogenic global warming is happening and that global temperatures are already about 1°C above pre-industrial levels. It says that past emissions alone are unlikely to drive temperatures above 1.5°C, but both CO2 and other greenhouse gas emissions that cause global warming need to be reduced to zero by 2050 to achieve the goal of limiting warming to 1.5°C. The call is to keep global warming to 1.5°C and not 2.0°C because the larger increase would have such severe implications on sea-level rises, loss of marine life from ocean acidification, and risks to health, food security, and water supplies, among other things. A positive is that the report addresses UN Sustainable Development Goals (SDGs) and acknowledges that these depend on each other. It also shows four pathways to achieve this goal, both with and without an overshoot of the goal. Also, the report has brought together a wealth of information to draw from, and the authors elaborate on why they assess the situation as more serious than they did with AR5, the previous assessment report in 2014.